Property Size 956 sq. 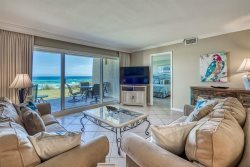 ft.
"Coastal Vibes" is a newly remodeled 2br/2ba home in the heart of Seagrove Beach and only 3 blocks from the beach. This charming cottage has all new furniture throughout. The living room has a flat screen tv with DirectTV, a queen sleeper sofa, and a plush sitting chair. The kitchen has all new stainless steel appliances, granite countertops and tiled backsplash. This kitchen is fully equipped with everything your will need for a wonderful home cooked meal. Small appliances include dual coffee maker for regular pot or single serve, blender, toaster, hand mixer and a crockpot. The master bedroom has a king bed and flat screen tv. The en suite bathroom has a granite vanity and a tub/shower combo. The second bedroom has a bunk with a full size bed on the bottom and a twin on top. It also has a flat screen tv. The shared bathroom has a tub/shower combo. The 16 home neighborood has a community pool with two charcoal grills for your use. The beach is a short 6-7 minute walk from the home. There is enough space in the driveway for two vehicles. Add $125.00 for housekeeping and 11% for tax. There is a $30 booking fee, $69 damage waiver; 2.50% to process credit card payments. 25% down payment is due at booking and the remaining balance is due 30 days prior to your arrival.